DHDC’s state of the art HD polycam system provides LIVE streaming of programs directly into classrooms nationwide! All programs are fully interactive, allowing students and teachers to communicate with DHDC presenters in real time! Science Live! shows are 60 minutes long unless otherwise noted, and Lecture Series presentations are either 30 or 50 minutes in length depending on content and grade level of audience. No minimum student count, maximum of 500 students per reserved Distance Learning program. No audio or video recording of programs allowed. To reserve your Distance Learning Program for a custom date and time, visit the CILC website by clicking here. Select Don Harrington Discovery Center Amarillo from the dropdown menu under Content Provider and select your program. To choose and reserve your program from a list of scheduled Distance Learning Programs, visit the Connect2Texas website by clicking here. Select Don Harrington Discovery Center from the provider dropdown menu in the Program Filter on the right. Due to technical requirements, all Distance Learning Reservations must be made via one of these two sites. Learn about paleontology and the study of prehistoric life including: what a fossil is and how they are made, different types of fossils, what the Earth and life was like in the prehistoric past, and meet some interesting animals and plants that existed in the deep past. The lecture can be modified to talk about a particular prehistoric time period or in a more general format. Dino Disaster! Where Did the Dinosaurs Go? Sixty-six million years ago, one of the most important groups of animals on Earth went extinct or did they? Learn about the Cretaceous – Paleocene extinction event and what happened to the dinosaurs. Temperate Grasslands are one of the major biomes on Earth, covering vast areas on nearly every continent. Learn about this amazing biome including the physical and climate conditions necessary for its occurrence, unique characteristics of this biome, grassland animal and plant adaptations, and a virtual tour of different grasslands from around the world. Our Earth showcases an amazing array of biomes and organisms that occupy them. Learn about these major environments including their climatic parameters, origins, physical geography and topography, soil compositions, the organisms (and their adaptations to such environments), and other characteristics. 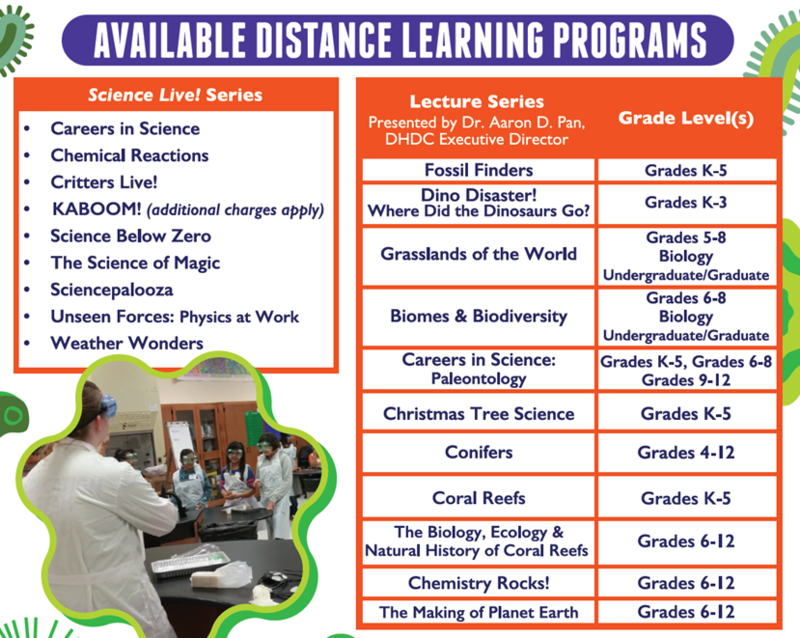 Students will also get a virtual tour of different ecosystems within each of these biomes from around the world and discover the amazing variety of life on Earth. Learn about the paleontology, the study of extinct life, and the scientists that practice it. Also, learn about the different career paths that paleontologists and field research scientists pursue and the requirements necessary to become a paleontologist.